Triple Double Prospects spent this past weekend on the highway, checking out top Ohio talent in Cincinnati, Toledo and Columbus over the course of three events. First, at the Queen City Superstars Preview we got an early look at the city league teams from Cincinnati. Second, in Toledo we saw some of Ohio’s best match up with Detroit’s in the Ohio vs Michigan Super Scrimmage. Finally, at the Columbus City League Preview, we saw some of the top high school competition in the central Ohio area. Dazhontae Bennett – ’14 SG Dayton Trotwood Madison: Bennett showed out in a major way on Friday night in Cincinnati, leading his Trotwood team to a one-point win over a talented Cincinnati Aiken squad. Bennett showcased his top-notch athletic ability with several dunks both in transition and traffic. Athleticism is the strong suit for the 6’0 senior, but he’s also a very good jump shooter from the three-point line and in, and although he isn’t a great ballhandler he can easily get to the rim at will at the high school level. Trotwood is likely going to surprise some people in the Dayton area this year, and they’re going to do so at the hands of Bennett, one of the top seniors in the area. 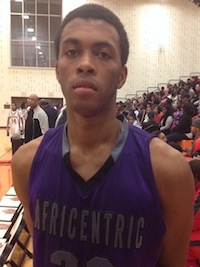 Dwight Nared – ’14 PF/C Cincinnati Hughes: Nared continued his rapid ascension on Friday in Cincinnati, and then followed up with an equally strong performance on Saturday in Toledo. The 6’6 senior is a very good athlete with length who makes himself better by playing with a strong motor. Since the end of his junior season, Nared has improved considerably as both a defensive rebounder and a finisher on the low block, where he is starting to consistently make his right-handed hook shot. JaQuan Harrison – ’15 SG/SF Columbus Africentric: Harrison has always been a breath-taking athlete, but this fall the 6’2 junior wing has started to show improvements in his skill-set. Harrison is starting to use his athleticism effectively in the full-court, rebounding the ball offensively, taking it strong to the rim and really making noise as an on-ball defender in the half-court. With his physical tools, Harrison has the ability to become one of the breakout players in Ohio in his junior campaign, as he continues to improve his ball-handling and shooting. A definite Division I prospect, expect to hear Harrison’s name more and more in recruiting circles. Doug Taylor – ’15 C Columbus Northland: Taylor has always had potential but lacked consistency. However, if what he showed TDP on Saturday night in Columbus is something that he’ll be able to keep up, he’s going to have a huge year. The 6’8 junior has a great low-post frame with size, wide shoulders and enough explosiveness to finish in traffic. Taylor has become a more active rebounder, shows instincts as a shot-blocker and more than anything has a renewed sense of confidence. He might not get a ton of publicity on a Northland team loaded with talent, but Taylor is on his way to establishing himself as one of Columbus’ premier juniors. 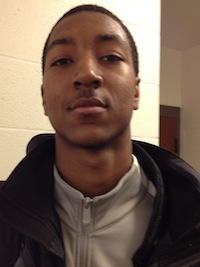 Elijah Pughsley – ’15 PG/SG Cincinnati Hughes: Pughsley’s shot was a little off when we last saw him in a fall showcase. However, this weekend the transfer from the Lima area was locked in, as he made several deep three-pointers (his patented shot) in events on Friday in Cincinnati and Saturday in Toledo. The 6’0 combo guard also showed his usual fiery demeanor, while also proving that at Hughes he has committed himself to working on his on-ball defense. We still want to see Pughsley make consistently good decisions with the ball when he plays the point, but he has the shot-making ability to have a huge junior year. Brandon Austin – ’15 PG Toledo Rogers: Following up with what we saw in the tail-end of last AAU season, Austin is on his way to becoming Ohio’s best point guard that you’ve never heard of. With a strong but compact 5’10 frame and good quickness, Austin is able to create separation with a tight handle for Rogers, similarly to how the team used Tony Kynard in their state runner-up run last season. Also like Kynard, Austin is a capable shot-maker from the three-point line and is constantly looking for the pull-up on a Rogers team that likes to get a shot off in the first ten seconds of a possession. A tough competitor who should only get better with varsity experience, look for Austin to make waves in the Northwest Ohio region this season as a junior. Shadrick Kimble – ’15 SG Columbus Brookhaven: Kimble is a prospect that TDP was not familiar with heading into the Columbus City League Preview on Saturday evening, but he impressed us enough to deserve a mention in this wright up. The 6’2 wing is a strong ballhandler who can make open shots with good consistency. Showing a willingness to attack the basket, as well as find open space to launch a three-pointer, Kimble picked up the scoring slack for Brookhaven as they played without injured senior Ronnie Williams. When Williams returns, look for Kimble to play Robin to Williams’ Batman on a pretty good Brookhaven team this year. Houston Smith – ’16 SF Columbus Africentric: Like his teammate, JaQuan Hairston, Smith is a game-changing athlete who is learning to play the game of basketball. We’ve been kind of up and down on his game this fall, but the 6’4 sophomore was tremendous on Saturday. Smith threw down tip-dunks, pushed the ball in the open floor, and showed more of an offensive IQ then we’re used to seeing from him. It seems that he’s much better in a more structured game then he is in showcase settings, and we’re impressed that Smith seems to really respond to coaching. With that athletic ability, he’ll be one of the sophomores to watch in Columbus. Malik Harrison – ’16 SF Columbus Walnut Ridge: The more we watch Harrison the more impressed we become with the things that the 6’4 sophomore can do on the court. Harrison is an exceptional athlete (also a high school quarterback) who plays with a motor, and is a little bit more skilled than we’ve previously given him credit for. In Ridge’s win over Centennial, Harrison was the best player on the court, attacking the basket, showing instincts as a passer and rebounding on both ends. He’s still not going to be a go-to scorer, but Harrison is an excellent secondary scorer who can produce points even when plays are not run for him. Derrick Daniels – ’16 PF Dayton Thurgood Marshall: We’ve been a member of the Daniels fan club all fall (and further back), and nothing is going to change headed into the winter. The 6’8 sophomore was just simply exceptional on Saturday in Toledo, competing hard against some very talented and physical big men from Detroit. Daniels was most impressive as a shot-blocker, where he altered shots of post players on the ball, and denied shots from the help side position when guards attacked the rim. The highlight of the day came when Daniels went up in transition and rejected the shot of an athletic 6’5 Detroit wing well above the rim. Offensively, Daniels didn’t get as many touches as he normally does, but finished efficiently around the rim with power and athleticism. Darnell Hoskins Jr – ’16 PG Dayton Thurgood Marshall: We initially thought that Hoskins would play more of a supporting role in his sophomore season on the TM varsity. However, based on what we saw on Saturday the son of head coach Darnell Hoskins Sr, will be a player that is counted on heavily for the Cougars. Hoskins can make shots from deep, a commodity at Thurgood, is a very good decision maker and has the quickness to play the style of defense that Thurgood is famous for. He’s still smaller in stature, but that’s worked out fine for other Thurgood guards, and we’re expecting Hoskins to be an impact sophomore in the Dayton area this season. Kameron Moore – ’16 PF Cincinnati Aiken: After struggling in the first half on Friday night against a smaller Trotwood team, Moore showed heart in the second half as he picked his play up and scored several key baskets to keep his team alive. A powerful and athletic 6’6 post player with toughness, Moore is starting to improve as a face-up player who can attack from fifteen feet and in. He’s not going to have the size of a traditional low-post guy, but his athleticism allows him to offensively rebound to score, and at 6’6 he can still play the center spot when needed at the high school level. The most talented sophomore in the Cincinnati city league, Aiken might go as far as their lone post threat can take them this season. If Moore plays well, Aiken is the likely favorite to take the league title. High schools fan in Ohio should also keep their eyes on a quartet of small guards from the senior class who should have big seasons. Cincinnati Aiken’s Correy Cavins, Dayton Meadowdale’s Xavier Gualette, Columbus Centennial’s Octavious Luke and Dayton Trotwood Madison’s Patwaun Hudson all impressed TDP over the weekend with their floor game and leadership ability. Despite a lack of size, all four of these class of 2014 guards are strong competitors, capable scorers and will be players who smaller colleges will be tracking throughout the season. Also impressing at the guard position were Dayton Thurgood Marshall seniors Davion Ashe and RaChaun Martin. Two quick defenders and transition drivers, look for Ashe and Martin to pick up where they left off last season in leading Thurgood Marshall to a deep tournament run. Additionally, another guard, Columbus Walnut Ridge’s Dymeire Finch also caught our eye with his play on Saturday. A more well known combo guard that is better as a scorer, Finch played very well on Saturday, and will likely lead a talented Walnut Ridge team into contention for their division in Columbus’ city league.